Good morning! Welcome to The Morning Shift, your roundup of the autonews you crave, all in one place every weekday morning. Here are the important stories you need to know. Tesla’s no stranger to just kinda-sorta delivering on big promises, yet still pulling out with a vehicle that makes up for it. This time, though, buyers may be growing wary of CEO Elon Musk’s back-and-forth. Analysts at Goldman Sachs and KeyBanc Capital Markets reported demand for Tesla’s upcoming Model S and Model X vehicles is lagging. High demand is imperative for the carmaker, as it’s spending (and borrowing) heavily to bring out the Model 3. Tesla reported a decline in shipment of its Model S sedans and Model X sport utility cars from the last quarter, and many analysts are saying demand for these models is finally plateauing — a bad sign for its much-anticipated affordable Model 3 sedan. Goldman Sachs cut its six-month price target for Tesla stock by $10, to $180. Eight analysts rate the shares a buy, 10 recommend holding and six suggest selling. Tesla shares plunged 7.5 percent Wednesday, the steepest one-day decline at the company in the last year, mimicking investor skepticism. This isn’t the first time Musk over-promised, under-delivered or delivered late. 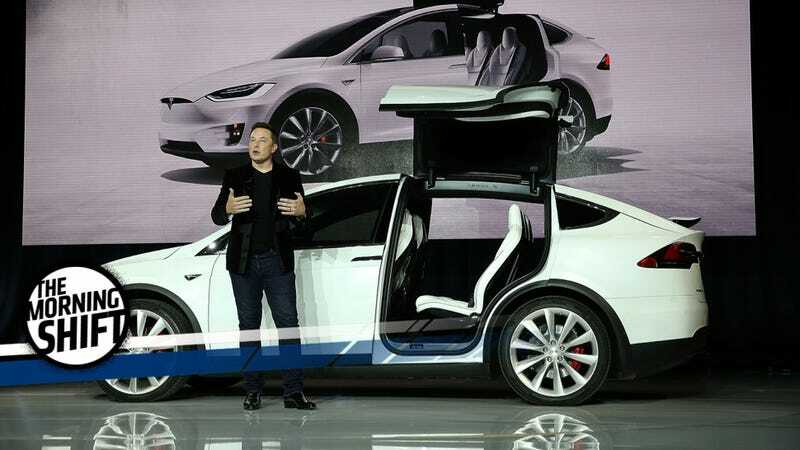 Delays have been commonplace from the first Roadster to the initial buggy Model S, to the Model X. Though maybe this time, THIS TIME, for real you guys, he can do it. The auto industry has been meeting consumer demand by producing SUVs and trucks over dinky passenger cars, a move that SOMETHING. For the first time ever, not a single passenger car from a Detroit Big Three automaker is up for vehicle honors at the 2018 North American Car, Truck and Utility Vehicle of the Year award, which doesn’t matter anyways because awards are a joke. Tesla, which champions itself on its five star safety rating, failed to get the highest scores small overlap front crash test from the Insurance Institute for Highway Safety. The Model S earned “acceptable” on the test, where part of the vehicle’s front end strikes a barrier, because the seat belt did not restrain the test dummy enough, according to the IIHS. Instead, Lincoln, Mercedes and Toyota earned the top honors for crashworthiness by earning “good” ratings in five crash tests, the Automotive News reports. Tesla. It’s okay. Your car is six years old. It’s fine. You don’t need to come up with a conspiracy theory. Just make a new car, like everyone else does. You’d be hard pressed to find a South Korean who’d trade in their Kia for a Chrysler, because why the hell would you. And when meeting South Korean President Moon Jae-in last week, Trump promised the U.S. would do more to address the trade imbalances between the two countries, including bringing American cars to the Korean market. But Ford, Chrysler and GM vehicles only make up one percent of the market in the region, even though imports for these companies more than doubled in the last year. In Korea, U.S. imports are seen as lagging German brands in brand image, sophistication and fuel economy, industry experts say. U.S. imports do have a competitive advantage in electric cars: Tesla Motors’ electric vehicles are seen as both environmentally friendly and trendy, while GM has launched a long-range Bolt EV. The Fiesta ST is pretty cool, though. Potential threats to the retailers also are coming from the likes of automakers including Ford Motor Co. and dealership groups such as AutoNation Inc. The companies are making an increasingly crowded bet that aftermarket car parts will be in greater demand from Americans that are holding onto their vehicles longer than ever — the average vehicle on U.S. roads is approaching a record 12 years. The real news here, however, is that jingle is now stuck in your head. Reims, famous for its 13th-century cathedral, hosted the oldest Grand Prix race, the French Grand Prix, at its Reims-Gueux course a total of 14 times (the last time in 1966). Neutral: Will Tesla’s Big Talking Screw Itself Over? Or will it not, because it never does?